Attrib allows a user to change the attributes of a file or files. With attrib, you can change any of the add or remove any of the attributes below. Read-only - Allows the file to be only viewed and not written to or changed. Archived - Allows Microsoft Backup and other backup programs to know what files to backup. Hidden - Makes files invisible to standard users and hidden if show hidden files is not enabled. System - Makes the file an important system file. Note: With new versions of Windows (e.g., Windows 7, 8, and 10) there are additional attrib options not mentioned in the above list. See the syntax for your version of Windows to get all available options. Note: If you need to change the ACL of a file see the CACLS command. The attrib command is an external command that is available in the below Microsoft operating systems attrib.exe. Windows 7 and Windows 8 syntax. Microsoft Windows 2000 and Windows XP syntax. Microsoft Windows 2000 and Windows XP recovery console syntax. Microsoft Windows 95, 98, and ME syntax. /S Processes matching files in the current folder and all subfolders. /L Work on the attributes of the symbolic link versus the target of the symbolic link. See our attrib examples for information and examples on how to use this command. Note: The options below are the available options in the Windows recovery console. Typing attrib by itself displays all files in the current directory and each of their attributes. If any file is hidden, it also displays those files. As can be seen in the above example, we typed the dir command to list the files in the current directory and could only see the "computer.bat" file listed. However, if you type attrib by itself, there are three files in this directory, "computer.bat" with read-only, "example.txt" with hidden, and "hope.txt" with the hidden and read-only attribute. Add the read-only attribute to the autoexec.bat file to prevent it from being modified until the read-only attribute is taken off. This command is helpful for important system files or any other file that you do not want to have mistakenly edited or changed by another program. Add the hidden attribute to the config.sys file, causing it to be not be seen by the average user. This command does the opposite of the example shown before this command. Instead of hiding the file this command makes the file visible if hidden. Finally, this example adds two attributes to the autoexec.bat and makes the file read-only as well as hidden. How can I see hidden files in MS-DOS? 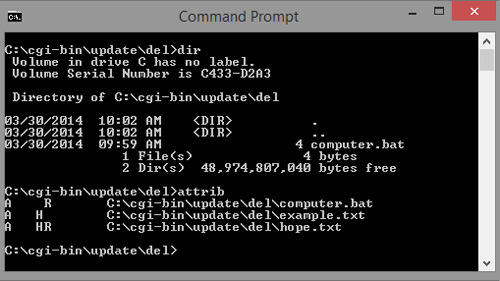 Below is the MS-DOS and the Windows command line file attributes bit positions and hexadecimal values with bit positions in the order of "7 6 5 4 3 2 1 0." 0 0 1 0 0 0 0 1 21h Read-only and archive. 0 0 1 1 0 0 1 0 32h Hidden, subdirectory, and archive. 0 0 1 0 0 1 1 1 27h Read-only, hidden, system file, and archive. 0 0 1 0 0 0 1 1 23h Read-only, hidden, and archive. See our ACL, file attributes, and permission definitions for further information and related links on these terms.